Note: Formatting may be lost due to copy and paste. And then my TBR list grows by a book. 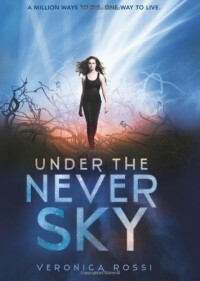 But Under the Never Sky is about a girl named Aria who lives in a futuristic world of Pods and Realms. In that world, she's never seen what's outside the Pods aside from the stories she heard – everything is basically in virtual time. 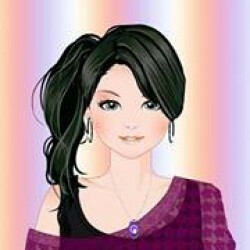 She gets kicked out one day and meets an Outsider named Perry who teaches her the basics to surviving the outside world and needs her help as well. I like the concept and general idea of the book. Pods? Realms? No one gets hurt in the Realms and you can see your friends without even moving at all with a cool gadget called Smarteyes? Sounds great. But... I didn't really like it. I was pretty bored from the end of Chapter One and probably would have stopped reading the book from then on out. But there was something there, and I decided to read on to see if my boredom status changed by a magnitude. I was hoping that between the end of Chapter One and the end of the book, my opinions would be a whole lot better. It didn't change that much, unfortunately. It was just... insipid. Another thing that I didn't really like? The romance between Aria and Perry. It was too fast. It was perfectly paced for about 80% of the book. But then about 7% or 4 chapters later away from their first kiss, it was just simply too fast for my taste. Much too fast. Overall, I liked the concept, but Veronica Rossi's debut novel just isn't very right for me and I don't think I'll be continuing on with the next book in the series, Through the Ever Night. Though I am a bit tempted to. Convince me well enough to do so and I'll think about it? But the cover is pretty.